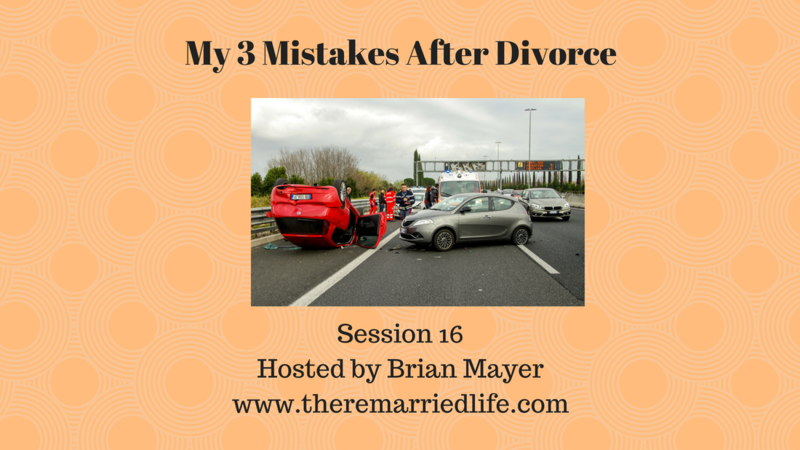 In this episode, I am going to be very transparent about life immediately following my separation and eventual divorce and the mistakes I made. It’s my hope that if you are in this period of your life that you will learn from this and not make the same mistakes. Mistake #1: Jumping Back in to Relationships to Soon. I can’t remember exactly but I believe I started dating with 2-3 months after the separation. I had not even begun to go through the grieving process – which is a process of Denial, Anger, Bargaining, Depression, and then finally Acceptance. After 2-3 months, I am pretty sure I was in the Denial phase still. Experts say it usually takes at least 1 year to go through the full grieving process. I remember her then leaving, and I told myself I needed to do something to help with this pent up feeling. I joined a gym a few days later and this helped me immensely. It was not a cure all but it did help. Mistake #3: Not following through with Counseling. My Uncle recommended a good counselor. I ended up going but only went for 4 sessions. At the time, I had never been to counseling and did not know what to expect. I remembered thinking after those 4 sessions, okay now I am good. I got this. It was obvious looking back now that I did not because it took a total of 3-4 years for me to feel good about myself and life again. Now that I am professional counselor and sit on the other side, I now realize how long it can take the brain to change. It is indeed capable but it can take months or even years to undo the damage that was done to it. I heard an analogy once that stuck. Your problems are like a screw being drilled in the wall. The counseling or recovery piece can’t treat it like a nail simply to be pulled out. It has to be back out the way it was put in. Give the relationship that has ended some time for you to fully grieve and process. Vent anger in a constructive manner through helpful coping mechanisms like joining a gym. Find other helpful things like music, reading, spending time with friends, hiking in nature, journaling, or whatever you find helps you feel better. Consider counseling and be willing to stick with it for the long haul. Find a therapist that considers your needs and goals and treat you as an individual with specific needs.